AB 1844 prohibits an employer from asking for or requiring an employee or applicant to provide their username or password to any social media outlet. It also prohibits employer retaliation for not complying with such a request. AB 2020 removes the option of choosing a urine test to determine the drug content of blood. Instead, those suspected of driving under the influence will only be given the option of a blood or breath test. If a blood test is unavailable, a urine test will be administered in its place. AB 2230 requires in-bay and conveyor car washes built after Jan. 1, 2014, to use a water system that recycles at least 60 percent of the wash and rinse water, or to use recycled water provided by a water supplier. SB 542 authorizes the expansion of the Inmate Welfare Fund under the Department of Corrections and Rehabilitation to include providing education programs, hobby and recreational programs, inmate family visiting services, leisure-time activities and assistance with obtaining a DMV photo ID. AB 278 allows the Real Estate Commissioner to adopt regulations that establish a system of citations to licensees who are in violation of the Real Estate Law. AB 1569 extends Laura’s Law to Jan. 1, 2019, which regulates designated assisted outpatient treatment services, which counties may choose to provide for their residents or may be court ordered. AB 2094 amends existing law regarding domestic violence to increase the penalty fee from $400 to $500 for state and local domestic violence programs. Also requires the court to state on the record the reason for reducing or waiving the fee if it cannot be paid in full by the defendant. SB 917 revises the current punishment for animal abuse to include a maximum of one year imprisonment in addition to a maximum fine of $20,000. AB 1453 requires an individual or small group healthcare service plan that is issued, amended, or renewed on or after Jan. 1, 2014, to cover essential health benefits, which must include services from within the following 10 categories (at least): ambulatory patient services; emergency services; hospitalization; maternity and newborn care; mental health and substance use disorder services, prescription drugs; rehabilitative services and devices; laboratory services; preventive and wellness services and chronic disease management; and pediatric services. AB 1162 increases the penalty for poaching from a maximum of $10,000 to $40,000. SB 1202 increases licensure requirements for dental hygienists, and allows for the provision of additional restrictions. AB 861 increases fines for public utility companies, and their ambassadors, when found to be in violation of the Public Utilities Act or the California Constitution. Depending on the type of violation, the fine increases from a maximum of $1,000 to $5,000 and $20,000 to $50,000. SB 1140 states that marriage is a personal relation arising from a civil, not religious, contract. However, an officiant of any religious background is not required to solemnize a marriage contrary to their faith. AB 1812 redefines “beer” under the Alcoholic Beverage Control Act to include that which has been aged in barrels previously used to contain wine or distilled spirits. AB 1470 establishes the State Department of State Hospitals, transferring all regulation regarding such hospitals to the department. It provides that a specified state hospital shall be used when a sexually violent predator is committed for mental health treatment and the beds total at another hospital. AB 907 deletes obsolete rate increases of bar pilotage for vessels inward or outward bound through the Golden Gate or the bays of San Francisco, San Pablo and Suisun. AB 1203 requires a school or community college district to provide a paid leave of absence to a member of its employee organization for authorized activities. It also requires the employee organization to reimburse the district. For a complete listing of the new laws, click here. Annie – thanks a bunch for pulling this all together. Helps with the cobwegs of a hingeofer. Most of these seem like relatively modest but positive contributions to our society. California is shaping up to be one of the more sane states in the US with a progressive orientation despite its economic dependence on the military-industrial establishment. 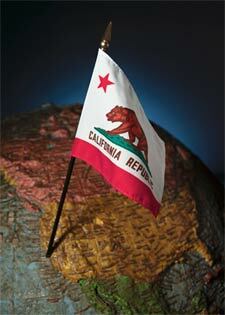 At least the CA State Legislature is actually doing work, unlike the Republican Congress…..